Happy Thanksgiving.....and to all a good night! Has anyone relocated their VHF antenna from the factory location? I saw a chart that lists BALLPARK ranges for reference only and it looks like the height vs transmitting range doesn't increase all that much (increase in longer range per foot of height increase) That said though I'm pondering relocating mine to the top of the arch instead of the arch uprights as I originally pondered. Have any of you done this? If so any issues (other than having to lower it more frequently in some cases)? Any instances where testing with known locations verified you were reaching farther or transmitting with more clarity? I'll be installing a new Shakespeare antenna that is identical in physical design to what's there and also changing out the plastic mount for a plated cast metal one. Two Julys ago when I bought her. It's a work in progress for sure! There are some things I've finished in COMPLETED PROJECTS but I've lost all the pictures I uploaded before they software changed. Did B/L have specific locations for the 2"round NMMA/ USCG labels? Found those via NMMA. No luck in Legacy/ cross ref catalog. I have a cierra 2655 1997 model and searching for 1. The AFT curtain and kit to extend my canvas. Can anyone direct me please, I have looked everywhere with no luck, I would like to do it myself instaed of going trough custom retailer. 2. I realised that there is no direct fresh water hose connection on the boat, if anyone has a clear video that I could follow, looked at one on you tube but not complete. Sounds like you're talking about the camper enclosure. As I began researching my '90, Kim at Canvas Plus and Leta's Top Shop, both in Arlington Wa kept popping up. Through several calls (best and quickest way to reach them) it came to light that at least for the 90, the enclosures weren't something Bayliner made for them. They were either made for dealerships by vendors or by owners after purchase. One suggestion they gave for a boat cover but could be used for a basic starting point for the sections is to use a roll of the heavy plastic that people roll out in crawl spaces under homes to trim and duct tape over the frame and getting with a canvas shop for tweaking and final cuts. I got one along with a bunch of other stuff from an '88 that was being parted out, frames' zip storage covers and all. Took it to a local boat upholsterer to have re-stitched, re zippered and new clear sections installed. You may have to build up a frame assy and have a upholsterer measure for unless you have a good sewing machine. Sea Dawg sells many fittings and frame parts. Your Bimini looks similar to mine. What's the width center top to center top of the gunwales aft of your Bimini and length from the outside of the aft berth outer wall and the mid point of the top of the stern? If close to mine I'll gladly send you pictures and dimensions of the frame this weekends and the canvas, but it'll be a while before I get it back.. Hopefully somebody with the same year model will have some better info. Mine has no city water inlet either. I bought this one from West Marine. They have a link on the product page for the instructions. Looks pretty straight forward. I'm going to install it myself once it warms up. Unlimited water supply that protects your boat’s freshwater system. The Shuflo water regulator inlet provides a port to connect to city water for an unlimited supply of freshwater. An internal check valve maintains a nominal pressure and guards the freshwater pump, fixtures and hoses against high pressure surges. A integrated backflow preventer allows the system to seamless switch back to onboard water tanks. Good luck with the projects and again...WELCOME! Nice to have some company on the page. Great lookin boat ya have! Dave --- is this the 5yr label you were referring to? If so, it is on the upper left corner of the hanging closet door on my 1998 BL Ciera 2655. Thak you for the information, i will check the inlet out. I have to really meassure my boat, however , I beleive its 9F1'' wide, the height of the arch, I have not meassured but will definteley do when it warms up and I prep her up. My arch and swim step have been in my sawmill/ fiberglass/ upholstery/ den since last summer along with other things I could fit through the door to keep busy on through winter. If I wasn't already single I'd for sure be by now! Every single piece of wood in mine was totted and the gel coat (like the rest of the boat) was totally chalky and rust stained from PO's not using stainless anything, and apparently nothing much else other than jump in and go.....jump out and go home, age and production standards of the era If it's a Ciera then I think you're right at right around a 9foot beam and I think that's outside to outside dimension I remember several posts mentioning that the Ciera's or at least some years did have that width, which in many states ( mine, N.C. is one) is the max width one can tow without needing certain permits. I know when I brought mine home the 2 lane state highway through the foothills sure had my head on a swivel LOL! 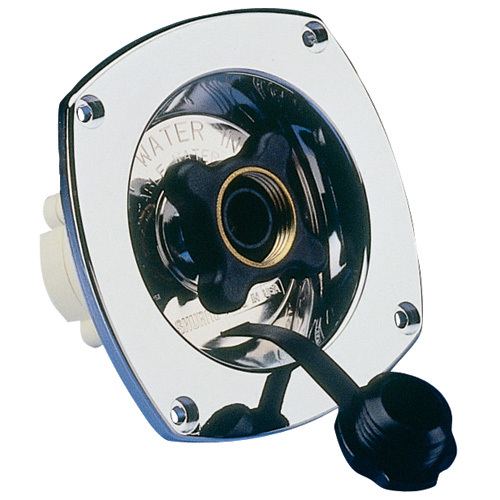 I realy wanted an all metal city water inlet but wasn't having much luck and I liked the recessed style of this one. The plastic is thick and very sturdy though. I'm going to install mine with a good layer of 4xxx marine adhesive/ sealant. Oh I forgot to mention.... When you get a chance, get back into your profile page and select USER SETTINGS from the drop down below your screen name at the upper right. Then, look down the left for CONVERSATION DETAIL OPTIONS, then click on EDIT POST SIGNATURE. There you can put all the pertinent details about your boat, options tow vehicle and whatever else you want. That way every time you make a post, it'll all show up and get you better, faster info since like-model folks will be more likely to see it. There's a TON of helpful folks on here but it helps to target your audience and that's the best way. I've owned only one other boat and it was pretty straight forward and didn't need a lot of work BUT since joining B.O.C I've learned so much and gained the confidence and know-how that I'm pretty much restoring everything from gel coat, electrical and many other projects I really had no clue about till I started talkijg with the members and cruising the topics! When they switched formats a while back, most pictures didn't make the migration but many of us are adding them back and members are glad to share specific stuff too via the message system. All the previous Series Owners failed to migrate too so slowly the pages like ours are being recreated so hopefully you and I'll have more company soon. I found the tubings and a flush-water regulator/inlet dfrom my local boat dealers shop. Yeah stalked, listing all the must buys I have to do, so that in mid may on my vacation I will work on her for 3 days full time and put her in the water or the weekend in April, so that I will not miss out on the first month seaon. What kind of tubing did you use for the water inlet. JezzaC, I haven't made it that far yet but plan on looking into what they plumb RV's with hoping it'll be less cost but as good quality and must be potable water safe, although for cooking and coffee I'll have bottled aboard. I'll keep you posted on progress. That project's going to include an external shower kit too beings my 6'2" fairly burly self finds the door to the head a fair squeeze LOL! Oh. I don't have that one. What I have is the metal item attached just to the left of the helm foot well. Cant read very much of it anymore and afraid to try to "clean" it as it will probably erase what is left of any information. Don't know if Bayliner would know what had been put on it or not. Would be nice to replace it. I am also planing to put some underwater blue lights and an extended swim platform for this season if I have time to install it myself. Got the plastic Jabsco water/inlet, to match with the boats colour, price difference between chrome and plastic is only 8$. For lots of reasons people are veering me off to stay away from chrome...oh well, I ma happy with which ever works. Will probably use some chlorine to fill up the water tank and cleans it off; right before the end of last year season, noticed the rotten egg smell and after much research, will use the chlorine.